Treat Youself to Dover Sole at Restaurant Michael Tonight! Restaurant Michael (64 Green Bay Rd., Winnetka, Ill.) is offering Dover Sole in honor of the Lenten season tonight (Friday, March 18)! This outstanding dish is available for $36 á la carte or as part of the prix fixe menu—$48/three-course and $55/four-course (plus tax and gratuity). Become indulged in this luscious dish as the Dover Sole is prepared traditionally in an ultra-light batter or à la Française. Upon ordering, choose how you would like to have your Dover Sole finished—with brown-butter, preserved lemon and capers, or with a lovely Charon sauce accented with fresh tarragon and a pinch of tomato. The Dover Sole is available in limited quantity so be sure to indicate preference when making a reservation. To make a reservation, please call Restaurant Michael at (847) 441-3100. Keep in mind, the seven-course Truffle Menu is available for $89 (add a wine flight for $24). Tonight’s featured performance presents the caberet song stylings of Petra van Nuis with guitarist Andy Brown from 6:30 p.m. to 9:30 p.m.
No offer may be used in conjunction with any other offer. This includes EVERYTHING except Restaurant Michael-issued gift certificates. No special offers may be redeemed for reservations held after 6:15 p.m. and before 8 p.m. on Friday and Saturday evenings. Special offerings include those offered by Restaurant Michael such as the Friday night special. Blackout dates include Valentine’s, Mothers’ Day, July 4th, Thanksgiving, Christmas, New Year’s Eve and any other generally-recognized special days. In honor of the Lenten season, Restaurant Michael (64 Green Bay Rd., Winnetka, Ill.) is offering Dover Sole tonight (Friday, March 11)! The sole will be prepared traditionally in an ultra-light batter or à la Française. Upon guest choice, the sole can be finished with brown-butter, preserved lemon and capers or a lovely Charon Sauce accented with fresh tarragon and a pinch of tomato. The beautiful dish is available á la carte for $36 or as part of the prix fixe menu structure—$48 (three-course) and $55 (four-course) plus tax and gratuity. Be sure to indicate preference when making a reservation as there are only 40 fish available. Please call Restaurant Michael at (847) 441-3100 to make a reservation. Restaurant Michael blackout policy specifics: •No offer may be used in conjunction with any other offer. This includes EVERYTHING except Restaurant Michael-issued gift certificates. •No special offers may be redeemed for reservations held after 6:15 p.m. and before 8 p.m. on Friday and Saturday evenings. •Special offerings include those offered by Restaurant Michael such as the Friday night special. •Blackout dates include Valentine’s, Mothers’ Day, July 4th, Thanksgiving, Christmas, New Year’s Eve and any other generally-recognized special days. About Restaurant MichaelRestaurant Michael serves classic haute cuisine in a contemporary presentation with French country flair. The restaurant is open for dinner Tuesday through Thursday 5:30 p.m. -10:30 p.m.; Friday and Saturday 5:30 p.m. -11:30 p.m.; and Sunday 4:30 p.m.-9 p.m. Call for seasonal hours. Complimentary parking is available. Major cards accepted. Be sure to “Like” Restaurant Michael on Facebook at www.facebook.com/RestaurantMichael and follow Michael on Twitter at @RestoMichael. Visit http://www.restaurantmichael.com/ for more information. For steak lovers, Fleming's Prime Steakhouse & Wine Bar (25 E. Ohio St., Chicago; (312) 329-9463 and 960 Milwaukee Ave., Lincolnshire, Ill.; (847) 793-0222) stands for tender prime beef. 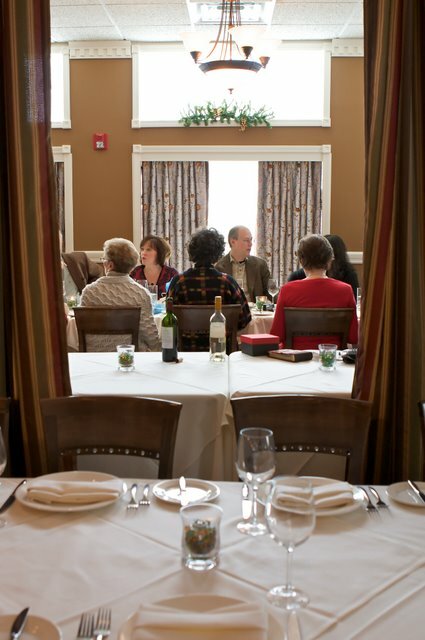 For guests observing Lent, Fleming's also features a generous selection of seafood offerings. And don't miss the award-winning collection of 100 wines by the glass, with buttery Chardonnays, crisp Sauvignons and reds that go brilliantly with seafood. For reservations, call Fleming’s—Lincolnshire, Ill. (847) 793-0333 or Chicago (312) 329-9463. Fleming’s (960 Milwaukee Ave., Lincolnshire, Ill.; (847) 793-0333) is hosting the Nehara Group from Hadassah, the Women’s Zionist Organization of America, for their 2nd Annual Spring Fashion Show at 11:30 a.m. Sunday, March 13. The young women of Nehara Hadassah will model trendy casual and active wear fashions accessorized by jewelry from Sweet Magnolia. Be sure to partake in a raffle for exquisite items—proceeds benefit stem cell research at Hadassah Hospital. Tickets are $40. For more information, contact the Hadassah North Shore office at (847) 205-1900 or e-mail northshore@hadassah.org. Hadassah is a volunteer women's organization whose members are motivated and inspired to strengthen their partnership with Israel, ensure Jewish continuity, and realize their potential as a dynamic force in American society. Hadassah enhances the quality of American and Jewish life through its education and Zionist youth programs, promotes health awareness, and provides personal enrichment and growth for its members. Hadassah North Shore is one of the largest Hadassah chapters in the nation, with 14 different groups all over the north shore and beyond. For more information, visit www.northshore.hadassah.org. 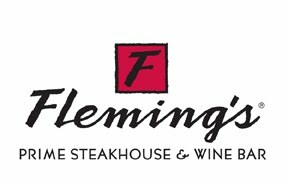 Nationally acclaimed Fleming's Prime Steakhouse & Wine Bar offers the best in steakhouse dining - Prime meats and chops, fresh fish and poultry, generous salads and side orders-with a unique wine list known as the "Fleming's 100™" that features 100 wines served by the glass. Fleming's was launched in Newport Beach, Calif. in 1998 by successful restaurant industry veterans Paul Fleming and Bill Allen. Today there are 64 restaurants nationwide. Fleming's is the recipient of numerous prestigious awards, including Wine Spectator's annual Awards of Excellence, and Wine Enthusiast's annual Awards of Distinction. For more information about Fleming's Prime Steakhouse & Wine Bar, please visit www.FlemingsSteakhouse.com. Everyone will be Irish come March 17. 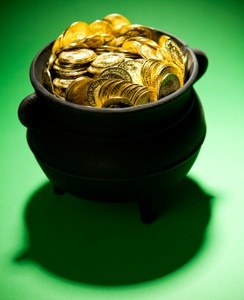 Here at Kurman Communications, we are honored to share our clients’ St. Patrick’s Day plans. Celebrate this year at one of these fabulous restaurants, a reason to feel lucky! 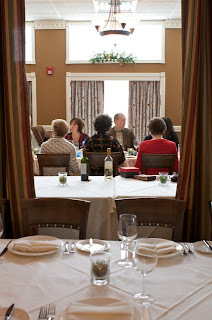 Consider Bistro One West (1 W. Illinois St., St. Charles, Ill; (630) 444-0600) the ideal location to enjoy a St. Patrick’s Day meal while enjoying a breath-taking view of the beautiful Fox River. 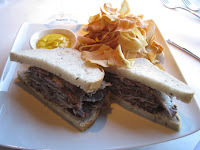 Bistro One West is specially preparing Wagyu Corned Beef in-house for the occasion— available March 12-19 both as a sandwich for $6 and an entrée for $16. The Wagyu Corned Beef Sandwich is served with their signature parsnip chips, making for a superb St. Paddy’s Day meal. Enjoy the Wagyu Corned Beef Entrée—served with cabbage and sautéed carrots, a delicious Irish meal sure to make its indulgers feel lucky. Celebrate St. Patrick’s Day (Thursday, March 17) this year at the Chicago French Market, offering an array of festive items provided by select vendors. City Fresh Market, a European-styled grocery destination offering west-loop commuters and shoppers healthy, quality items, is taking pre-orders for locally-made Bea’s Best corned beef brisket. Get your corned beef brisket this year, 13-15 pounds for $5.49-$5.99 per pound, from ‘the definitive west-loop neighborhood market’. Stop by Delightful Pastries for traditional, tasty handmade Irish scones, $2.50 each, and savory potato pie, $4 per slice. The bakery specializes in authentic European pastries, using local, natural and sustainably grown ingredients. Warm up at Lavazza Espression, offering Mint Èspessone TM. This delicious drink is made with Italian chocolate heated to a rich, thick delicious flavor, and topped with a fresh mint-flavored light mousse. Available from March 1- March 31, a small is $2.95 and large $3.75 (plus tax and gratuity). Did you know that Ireland is famous for its cheese? Choose from three distinct cheeses at Pastoral Artisan Cheese, Bread & Wine, a European-inspired, authentic neighborhood cheese shop. Coolea, $29.99 per pound— an Irish aged Gouda-style cheese made in County Cork. The complex flavors of this cheese hint at butterscotch and honey with a slightly nutty and savory note. Ardrahan, $26.99 per pound—a washed rind cheese from County Cork. The aroma of this cheese belies subtle flavors; savory and smokey with a slight cocoa note. Cashel Blue, $24.99 per pound—made in County Tipperary, this cheese is rich and creamy with slightly peppery pockets from the blue, a great blue for those who are intimidated by blue cheese. 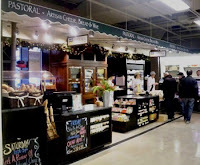 Stop by Pastoral Artisan Cheese, Bread & Wine Thursday, March 17 between 4:30 p.m. and 6p.m. to enjoy a no-cost beer tasting. Produce Express will be offering a bundle package including one pound of creamy white potatoes, one bag of carrots (approximately one pound), one head of green cabbage (approximately two pounds) and one large Spanish onion—all for $5 (tax included). Make your way to Provo’s Bakery, offering something sweet to satisfy the sweet-tooth. Featured sugar shamrock cookies are $1 each. Festive green and white butter cookies are available for $5 per half-pound, $10 per pound and $16 per 1.5 pound. During the month of March, Sweet Miss Giving’s is offering two limited edition, Irish-infused items—the Emerald Isle Cupcake and Shamrock Shortbread Cookie. Made fresh daily, baked goods at Sweet Miss Giving’s are all-natural and preservative free. Stop by to pick up one dozen Emerald Isle Cupcakes for $36 or a half-dozen for $18. Also available are Mini Emerald Isle Cupcakes—one dozen for $12. Don’t forget to indulge your Irish side (even if just for the day) with Shamrock cookies—$2 each. Please note that from January 2011 through May 2011, if traveling westbound on Randolph Street, the Randolph Street bridge is closed due to the Wacker Drive Reconstruction Project. The minor detour will reroute drivers to head north on Franklin Avenue, then west on Lake Street, to turn south on Clinton Street to access the garage. 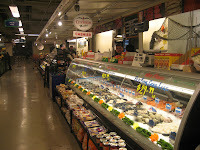 For more information, visit http://www.chicagofrenchmarket.com/. Follow Chicago French Market on Facebook at www.facebook.com/ChicagoFrenchMarket and on Twitter at @ChiFrenchMarket. In celebration of St. Patrick’s Day, Fleming’s Prime Steakhouse & Wine Bar (25 E. Ohio St., Chicago; (312) 329-9463 and 960 Milwaukee Ave., Lincolnshire, Ill.; (847) 793-0333) is offering Draught Guinness on the “5 for $6 ’til 7” bar menu for the special price of $6 for two bottles. It‘s the perfect way to raise an Irish toast with a friend. Draught Guinness is produced in Dublin using the same ingredients as the keg version and it‘s best enjoyed straight from the bottle. Every time you tilt it to drink, a special mixture of nitrogen is released into the stout, delivering the authentic Guinness experience with every sip. 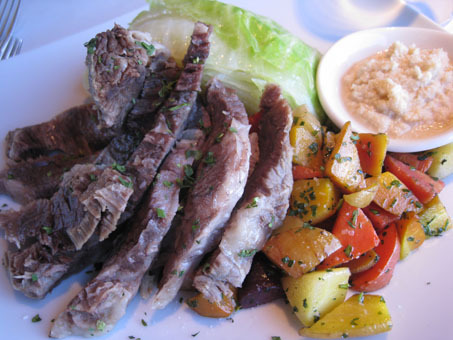 Did you know that lamb adds to a variety of traditional Irish cuisine? 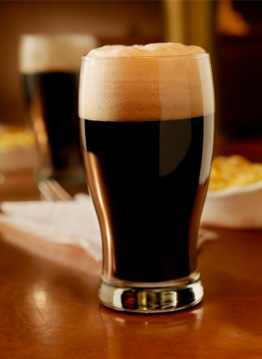 Try your Draught Guinness with New Zealand Lamb Chops—three double thick chops broiled and served with madeira sauce. 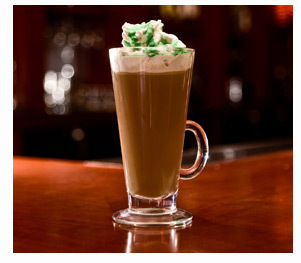 You can also enjoy Irish Coffee any evening at Fleming’s Prime Steakhouse & Wine Bar. Made with Irish Whisky, the delightful toddy with floating cream on top can be made at home— preheat a coffee cup or glass goblet with very hot water; pour out. Place two sugar cubes in the bottom of the goblet. Pour about 4 ounces of hot coffee over the sugar cubes; stir. Add 2 ounces of Jameson or Bushmills Irish Whisky; stir. Float a half-inch layer of whipped cream on top. Please call Fleming’s Prime Steakhouse & Wine Bar for pricing (Lincolnshire, Ill.—(847) 793-0333 and Chicago—(312) 329-9463). Fleming’s Prime Steakhouse & Wine Bar offers the best in steakhouse dining – prime meats and chops, fresh fish and poultry, generous salads and side orders—with a unique wine list that features 100 wines served by the glass. Fleming’s is the recipient of numerous prestigious awards, including Wine Spectator magazine’s annual Awards of Excellence, and Wine Enthusiast’s annual Awards of Distinction. 'Filet of Beef Tenderloin “En Croute” Sauce Perigord' Featured at Restaurant Michael Tonight! Tonight, (Friday, March 4) Restaurant Michael features Filet of Beef Tenderloin “En Croute” Sauce Perigord, a Restaurant Michael Signature Creation. 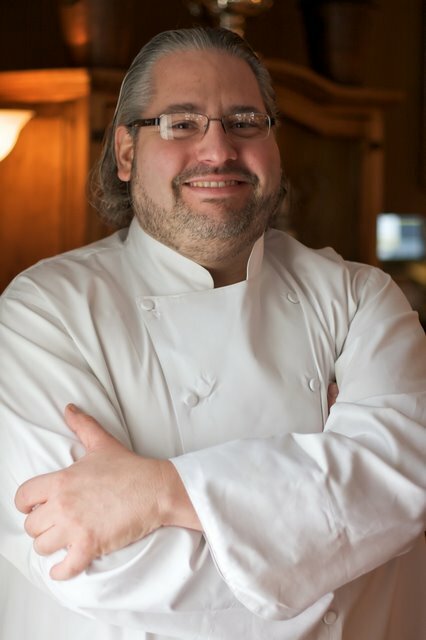 Restaurant Michael chef/owner, Michael Lachowicz, first learned of the dish while working in New York under Chef Maxime Ribera. Ribera, a French Master Chef, created the dish for the exclusive “Bocuse d’Or” culinary event in which he placed first. The dish is made up of a whole roasted tenderloin of beef wrapped in veal and truffle mousse, and baked in a puff pastry. The dish is included in the prix fixe format, $48 (three-course) and $55 (four-course) plus tax and gratuity. For guests with a lighter appetite, this delectable feature, Filet of Beef Tenderloin “En Croute” Sauce Perigord, is also available à la carte. Tonight will be the last time to try the luscious dish this season as Restaurant Michael only features it during the winter. Keep in mind, the seven-course Truffle Menu is available for $89 (add a wine flight for $24). Tonight’s live performance features the cabaret song stylings of Petra van Nuis with guitarist Andy Brown from 6:30 p.m. to 9:30 p.m.
•No offer may be used in conjunction with any other offer. This includes EVERYTHING except Restaurant Michael-issued gift certificates.